Each brand of mobile platforms is a solution to save your data and then restore it on the new phone; here I present the solution with Samsung Kies for Android device to save the contacts, images and other data on the computer. One of the things that gives laziness to change mobile is not to lose all the information, contacts and above all as the most important information. It is therefore necessary to have some way to copy phone data in somehwere and then recover several methods. One of the most used lately is to store all information in a website in the cloud, so that even if we have no telephone, but a computer is always available. Each manufacturer has its way, but are summarized in two major are Apple and Android. Apple has a platform that allows information stored on its servers called iCloud. On the other hand, although Samsung is the manufacturer of mobile phones and the leading software Android is owned by Google and the latter offers the possibility to store all the information also on their servers in a more distributed way as Gmail emails and contacts, pictures and documents in Google Drive, etc. There are two methods for you choice to backup and restore content from Samsung Galaxy phone. Despite all the solutions that we face for storage manufacturers online, many users want to backup imformation on their own computers and not always easy to find a program that allows it to perform. For Android phones, Samsung specifically for some, there is a program called Kies, to extract all the information and store them on your computer with Windows. Samsung Kies is a program that serves to connect the Samsung phone to the PC, such as the Samsung Galaxy or the Wave and the latest models with Android, among others. It allows two modes of connection between the computer and mobile wireless via Wi-Fi or through a USB cable. Free download and install the Samsung Kies on your computer, then connect your Samsung phone to PC via USB cable, Will the following screen, where we see that we recognized mobile displays. With the above as tabs, there is one that makes Data Backup / Restore Data. When you click the 'Backup', you'll be asked to specify a part to save the backup file. It is important to keep this file for when you want to restore. 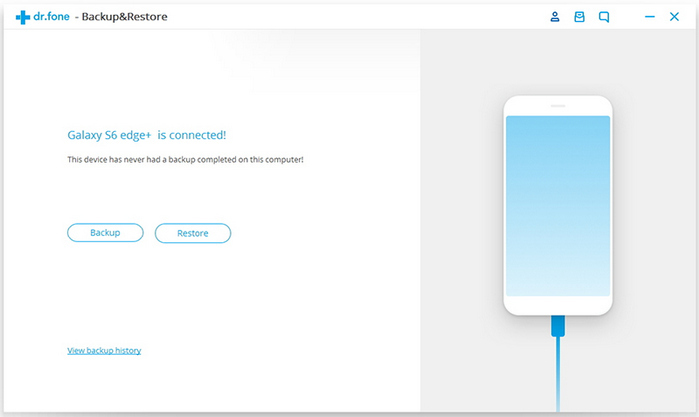 As shown in the next screen, we have the option of copying and restore data from a previous backup. you can select the data you want to restore. There are many choice for you to decide which type of file you want to restore, if you only want to restore contacts or photos from backup, just mark them. To take advantage of OS updates of cell phones, you need to have updated the firmware to the latest version. Samsung Kies is responsible for verifying if you have the latest update, and download and install if necessary. But the bad news: there's no simple way to transfer your SMS and contacts to your computer or Android device This method is not recommended, because if you don't do well, it can harm your Samsung phone. Therefore, I recommend against using them. If you unfortunately suffered data loss when tried this method, don't worry, you should stop using your phone to prevents newer data from being overwritten by older data, then follow this tutorial to retrieve lost data from Samsung Galaxy immediately. As we discussed on the method 1, Samsung Kies is responsible for verifying if you have the latest updates, you need to have updated the firmware to the latest version. It would pose numerous problems such as data loss, cell phone users crippling, shutdown, the information was censored, or even damaged SIM cards, chips and other hardware. 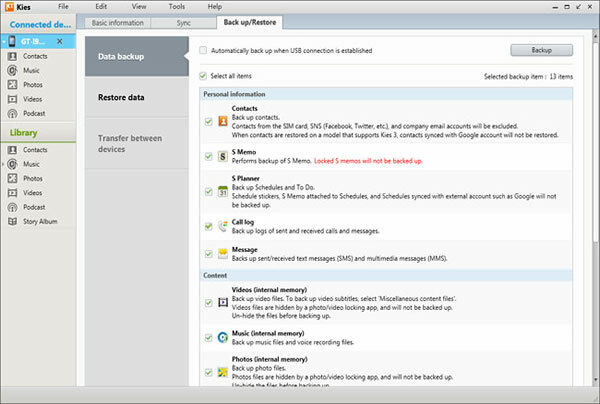 In order to backup and restore Data more safe and effective, we would strongly suggest that you'd better use the professional data transfer application – Phone Transfer, it was especially designed for those who need to backup and restore phone data to PC, another helpful feature is that it can allow users to move everything between different phones and system operating, this is a example of how to copy from iPhone to Android. In practice, though, this is possible to get right when the data is at all complex, backup and restore data can be done with in one click. When you run the Phone Transfer app on your computer, the primary window will be shown on your computer screen, as you see, there're four modes available. You should select the 'Backup & Restore '. You need to connect your Samsung Galaxy pone to your computer via USB cable, when your phone is recognized by the computer. It will analyze all the content stored in your phone and display them in the middle part of the program. 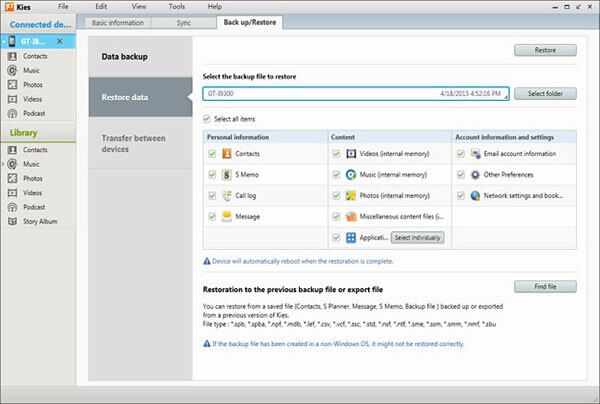 You can freely select which types of file you want to backup, just mark them and click the 'Backup'. When you connect our Samsung phone to computer, and then select the option 'Restore from Backups', all the previous backups that created by Phone Transfer will be detected and displayed in the left. Just select the one you need. And select the content you want to restore. You can erase your data before copy. When everything is ready, just click the 'Backup', the whole process will take some time based on the size of the data, after for a while; all the selected files will be transferred to your Samsung Galaxy phone completely. You can check the transferred content in your Samsung phone. Phone Transfer Application is great alternative for you that it can simply and safely backup and restore data from Samsung Galaxy or Note phones. You can select the items to be backed up and restore all or the desired thing any time. Transfer everything among iPhone, Android, Nokia and BlackBerry. Easily Backup and Restore Phone Data to Local Computer. 100+ Brands and 3000+ Mobile Devices Endorsed.